Faq | Lancaster Handcraft, LLC. What is the difference between Shaker and Mission? How is your Murphy Bed attached? Is there a Warranty on your Murphy Beds and matching cabinetry? What type of mattress does the bed use? Do we need a box spring? How high is the mattress off the floor? Can I install the Murphy Bed myself? Can we do custom widths, heights, and layouts to match our Murphy Bed? What is a baseboard notch and how do I measure for it? Can I take my Murphy Bed with me? How long does it take to receive my Murphy Bed? What is the difference between a Murphy Bed and a wallbed? Mission Panels have flat-inset panels with straight rails and stiles. Shaker panels have flat-inset panels but the rails and stiles are beaded. The crown molding for each style also differs. Mission's crown is a flat 45-degree crown, while Shaker's crown has a swooping cove. Our Murphy Beds are anchored to the wall through a header at the top of the bed. The installer will need to determine what is the appropriate fastener depending on the composition of the wall. Typically we attach to wood studs, metal studs, plaster, masonry and concrete. Yes, there is a Lifetime Warranty on the Murphy Bed’s lifting mechanism for the original owner. If any part should fail, return it to Lancaster Handcraft for a replacement. The bed cabinet and side cabinets fall under our standard Home Furnishings Warranty: We guarantee that the piece will be as advertised at the time of delivery. Drawers will work. Doors will work. Shelves will fit. We do not guarantee against the wood cracking or warping after it is in your home as these issues have to do with the environment in your home (too dry or too moist). Chair legs coming loose in your home is also excluded as this is usually due to abuse or to dry conditions. If you have any issue with a piece of furniture that has been delivered, it must be returned with the delivery person at the time of delivery in order to have it delivered again for free. If the delivery person leaves you can still have it repaired or replaced but you will have to pay for all shipping costs. Lancaster Handcraft’s Murphy Beds accommodate any standard mattress 12" thick or less. You have the option to customize the Murphy Bed cabinet, at an additional charge, to accommodate up to a 14" mattress if necessary. We handle Corscicana Brand Mattress and will be happy to guide your selection should you need one. We will deliver your mattress with your Murphy Bed the same day for a hassle-free experience. However, we can not remove the old mattress for disposal as we typically have a full load of furniture on the truck. Our Murphy Beds do not need a box spring. The mattress rests on our platform and is held in place by straps when in the closed position. Lancaster Handcraft’s Murphy Beds contain a platform that is 14" off the floor. For example, the top of a 10" mattress will be 24" off the floor when the bed in open. Murphy Beds are unassembled and packed into 3 boxes for shipping purposes. When you receive your Murphy Bed, you simply screw the pieces together and fasten the bed to the studs in the wall. It normally only takes two people 1-2 hours to install a Lancaster Handcraft Murphy Bed. Each one of our Murphy Beds come with complete step-by-step, easy to follow, installation instructions with telephone support as necessary. Our side cabinets come fully assembled. All you need to do is fasten the fully assembled cabinet to your Murphy Bed. Yes, yes and yes! We can accommodate changes to dimensions, layouts, designs, or styles to fit your needs. We do floor to ceiling and wall to wall projects that incorporate our Murphy Beds and max out storage options for our customers. Please be sure to provide as many details as you can in your initial quote request to streamline the process including wall dimensions, baseboard dimensions, locations of outlets etc. Call 717-455-7099 or email us to discuss your project. A baseboard notch can be added to each cabinet for ease of installation over your wall's existing baseboard trim. With this cutout, you do not need to remove your existing trim. Each cutout is rectangular and made to your specific baseboard dimensions. 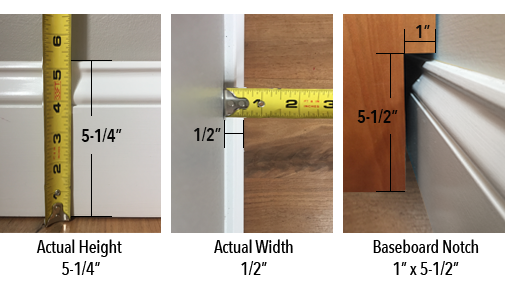 To measure the height of your baseboard trim, use a ruler or measuring tape and measure from the floor to the top of your baseboard. To measure the width, measure from the wall to the edge of your baseboard. Our cutouts are slightly oversized to accommodate slight variations. If you are using the Build Your Own Murphy Bed tool, you can upload similar pictures and input your measurements into the comment box after you add your Murphy Bed to the cart. If you do not have this information at the time of the order or have further questions, you can address this during your order confirmation process with your sales associate. Yes. Each Murphy Bed is crafted in a manner that allows it to be disassembled and relocated. Depending on our workload at the time of your order, the process can take about 10-12 weeks from the time you finalize the order until we are ready to schedule delivery and/or installation. If you have a particular target date in mind please let us know and we will do our very best to accommodate your wishes. Nothing. Murphy Beds are named for their inventor, William Lawrence Murphy who applied for his first patent in 1900. They often go by many other names: wallbeds or wall beds, folding beds, hidden beds, cabinet bed, panel bed, space-saving bed, library bed, dual-purpose bed or flip-down bed.